I’ve recently re-read John Gordon’s book, One Word. It’s a great way to stay tuned in, if you will, to positivity and building inner wealth. Your own and others. Creating open doors and opportunities for self growth through positive self-talk as you live and breathe your ONE WORD each day. Choose a word that will make a difference in who your are, set goals that will help you achieve the best version of that word. Then, pick a time period; a day, a week, a month or a whole year. Let it be your gift of greatness to self and to those in your circle of influence. Your impact can make a huge difference in your work, your health, your spirituality and more importantly, the changes you make will ripple out even further. 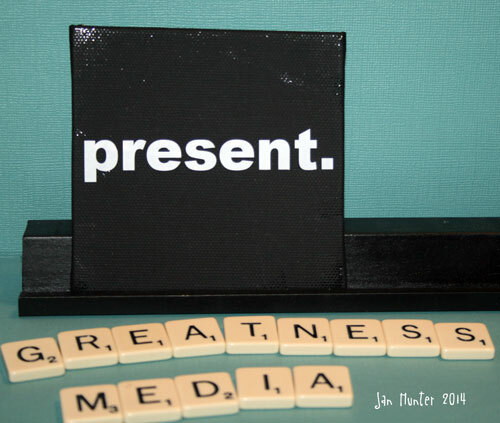 My word for February is being “present.” Present in the moment and seeing what is going right and good and naming them in a journal to be more accountable. I believe this is a very precious gift I can give myself and my family. I’m amazed at all that’s happened so far and we’re only one week into the month. I’ve accomplished more, listened more, felt more lived more fully in the last few days. I hope to establish this as a way of living from this point on. If you choose to take on the One Word challenge, I wish you well!